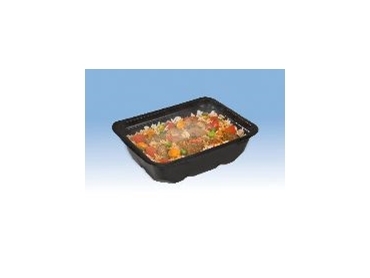 Ready Meal in CFS C-base Black (Meat, Rice &amp; Vegetables): Ready-to-eat meals can be packaged in an appetizing fashion with the CFS C-base film for SteamCook applications. CFS presents SteamCook, its latest packaging system that is specially developed for packaging ready-to-eat meals and side dishes that are steam-cooked in the microwave before they are eaten. Based on many years of experience in Thermoformers, Traysealers and film production, CFS now offers an optimally coordinated packaging system from one single source. Steam-cooking is very much the current trend because of the gentle, healthy and vitamin-preserving preparation of the food. Due to the development of our daily habits, time in general is rather short and many people would like healthy meals that are easy and quick to prepare. Meals that are steam-cooked in the microwave are therefore the ideal solution. CFS has the optimal packaging concept for this trend with its CFS SteamCook. Heating the product in a microwave sets off a steam-cooking process in which the top film forms a bubble. After a defined cooking time the steam escapes via a pre-bent corner of the pack and the healthy, steam-cooked meal or side dish is ready. The SteamCook concept encompasses packaging machines, Thermoformers, Traysealers and perfectly matching packaging film. Since CFS produces packaging machines as well as material, customers profit from the proven concept from a single source. For SteamCook CFS has two rigid films in its product range, C-base and eXbase(r). C-base stands out because of its unique transparency, brilliant colors and pleasantly smooth surface. C-base is suitable for microwave use and can be pasteurized. "The eXbase(r) rigid film is particularly well suited for microwave applications. Thanks to its unique foam structure, you can touch the tray immediately after heating in the microwave without burning your fingers. The foam structure provides for perfect insulation," Ina Heyl, Product Manager Packaging Materials, explains the advantages of this rigid film. eXbase(r) is also available in many different colors. The packaging machines for this concept (Thermoformer and Traysealer) are characterized by easy handling and a hygienic design. CFS adapts the system flexibly to the customers' specific spatial and performance needs. Ready-to-eat meals and side dishes packaged with SteamCook also meet with the approval of the end consumers. The meals are prepared in a flash, taste delicious and are healthy at the same time. Thanks to the vitamin-protecting steam-cooking process. The top film ensures that the microwave is just as clean after heating as before. Splashes are also avoided when the top film is removed since it can be pulled off without any problem thanks to the bent edge with "peel". CFS SteamCook is the latest packaging solution from CFS. However, complete solutions for the production of diverse ready-to-eat meals and side dishes, such as pasteurized refrigerated products or vegetable side dishes, can also be implemented from the CFS portfolio. As a special service, CFS additionally offers so-called Pack Consultancy. Our packaging designer creates, among other things, trays entirely according to the individual demands of the manufacturer that perfectly match the product and also stand out in the supermarket thanks to that certain something.